At 5.30pm on Tuesday, British and EU negotiating teams gathered in a room on the fifth floor of the European Commission’s Berlaymont headquarters. On the UK side were Steve Barclay, the Brexit Secretary, Geoffrey Cox, the Attorney General, senior advisor Olly Robbins, and Sir Tim Barrow, the UK ambassador to the EU. The guests at this publicised dinner included Steve Barclay MP from the Department for Exiting the EU and Olly Robbins, Mrs May's Europe adviser from Number 10. With them were Michel Barnier from the European Commission and his two deputies: Sabine Weyand and Stephanie Riso. The host was the UK's permanent representative to the EU, Sir Tim Barrow. epa07342588 British Labour Member of Parliament Hilary Benn speaks to the press after a meeting with Martin Selmayr, the Secretary General of the European Commission (not seen) and Britain's Ambassador to the European Union Tim Barrow (not seen) at the European Commission in Brussels, Belgium, 04 February 2019. EU officials have branded the Rock a “colony of the British Crown” in its legislation to prepare the bloc for a no-deal Brexit. 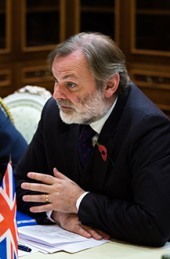 Theresa May’s EU ambassador, Sir Tim Barrow, contested the “completely inappropriate” wording in a heated meeting with his European counterparts in Brussels on Friday.